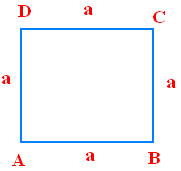 About "Area of Squares and Rectangles"
Area of squares and rectangles is the basic topic in mensuration. A plane figure with four equal straight sides and four right angles is called square. Generally there are 3 ways to find area of a square. We have to use one of those ways according to the information given in the question. Here "a" stands for the length of each side. here "d" stands for length of diagonal. A plane figure with four straight sides and four right angles.In which the opposite sides are having the same length. Here "L" represents length of the rectangle and "W" represents the width of the rectangle. Find the area of the square having side length 24 cm. A square is of area 64 cm². Then find its side length. The diagonals of two squares are in the ratio 2:5. Find the ratio of their area. Let the diagonals of two squares be 2x and 5x respectively. The length and width of the rectangle are in the ratio 5:2 .If the area of the rectangle is measuring 147 cm². Then find the length and width of the rectangle. 5x and 2x be the length and width of the rectangle respectively. Find the cost of carpeting a room 13 m long and 9 m broad with a carpet 75 cm wide at the rate of $12.40 per square meter. After having gone through the stuff given above, we hope that the students would have understood "Area of squares and rectangles".